This article reviews the motion control scene, and places the introduction of the Hybrid Hexapod® in context for pan-industrial manufacturers working at the bleeding edge of precision and repeatability. 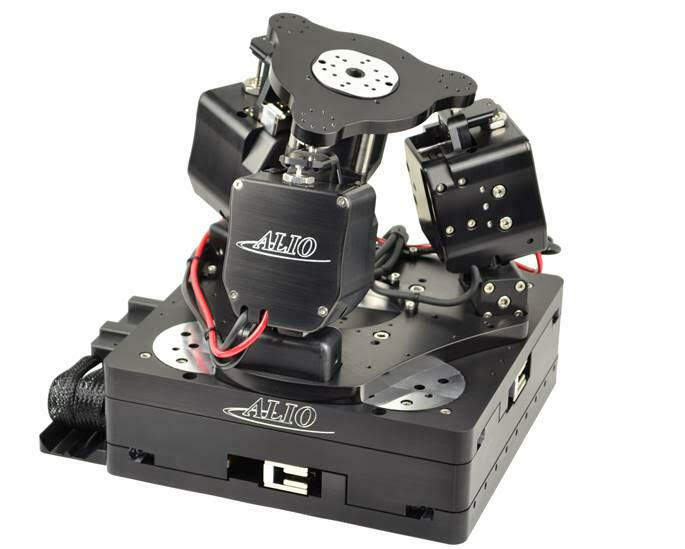 Nathan Brown | ALIO Industries, Inc.
For many years, when it comes to ultimate precision in motion control, the hexapod has been the “go to” technology, but has always struggled to take the step from micron tolerances to nanometer tolerances. Today the Hybrid Hexapod® technology has bridged the gap, and as such represents a vital spur to product innovation and next generation ultra-precision applications. This article reviews the motion control scene, and places the introduction of the Hybrid Hexapod® in context for pan-industrial manufacturers working at the bleeding edge of precision and repeatability. For some, the subject of motion control may seem a little dry, a little chewy! Often, the technical descriptions of “how” technologies allow greater and greater precision in motion control and tighter and tighter tolerance attainments are pretty impenetrable. Interesting on a level, but rarely passing the “so what” test when it comes to understanding the possibilities that exist for embracing sometimes expensive technology options when viewed through the prism of the upside for business and the enhancement of the bottom line. In this article, we will take a completely different perspective. We will suggest to you that the ONLY reason that you should invest in an ultra-precision motion control technology solution is if there is a real and understandable business case for doing so. We will also attempt to clear the fog. Fog? Well yes! Many technology providers make claims. Let’s face it, it is simple to say that a motion control technology can do something that it cannot. Many companies offer solutions at entry-level price points suggesting premium-priced functionality, others simply tell untruths or half-truths that flatter to deceive. “All well and good — classic lines of competitive engagement” you may say. But when working at the cutting edge of ultra-precision engineering, where manufacturers are constantly pushing the envelope and innovating, false claims and counter claims are at best confusing, but at worst lead to disappointment and disillusionment. Manufacturers miss out on real opportunities because they have sub-optimal experiences with inappropriately positioned technological solutions. This is good for no-one! It is within this context that this article will focus not just on general motion control issues, but also why one newly introduced motion control option in particular — the Hybrid Hexapod® technology — is disruptive and unique in its ability to open up motion control accuracy that to this point has been impossible to achieve. When discussing micro manufacturing, precision engineering, and ultra-precision engineering, we are in a relatively undefined environment. What is precision for one company will not be precision for another, and in many instances technologies that are “good enough” when it comes to accuracy and attainment of tolerances are perfectly well suited for many applications. As they say, you don’t always need a Rolls Royce to get to the shops! But when looking at the area of ultra-precision engineering, we are all working at the bleeding edge of what is possible, where not just microns matter, but sub-micron and nanometer tolerances are an everyday requirement. This is a world where repeatable reliable precision and motion control not just desirable, it is vital. When looking at motion control in precision and ultra-precision engineering, there are a plethora of alternative technologies, and also an array of options that provide a range of accuracy parameters suitable for different applications. Let’s start by taking a 6-mile high view of the area of precision motion control options. The burgeoning field of precision motion control is driven by industry demand for technologies that will improve production processes. The emphasis from across industry is for smarter, smaller, and faster precision motion control and positioning equipment, and demand is especially high in areas like laser micro machining, micro assembly automation, optical inspection, semiconductor metrology, and photonics components test and alignment applications. We are working at the cutting edge here. For example, finer and faster control of motion is at the heart of super-resolution microscopies and the latest photonics and materials developments. Like never before, design engineers and motion control engineers from across a host of industry sectors have at their fingertips motion control options that not only achieve what their applications require, but in many instances advance innovation by enabling processes that were previously impossible. This article will have at its core focus hexapod technologies. In the last 20-25 years, there has been more and more interest in hexapods to cater for the increased demand for micron, and sub-micron level precision in multi-axis motion applications. Hexapod motion control technology exists at the ultra-precision end of motion control, and it has been the best-in-class motion control solution for exacting industrial applications. The Hybrid Hexapod® sits at the very top of this ultra-precise tree when it comes to repeatable ultra-precision motion control, and this article will describe why the Hybrid Hexapod® is unique and opens up new levels of innovation and manufacturing efficiency previously considered impossible. But before looking at the opportunities this unique technology opens up, lets back up a little, and briefly overview a few of the array of alternative motion control solutions that exist today. In the area of motion control, one-size certainly does not fit all. As just mentioned, hexapods in general and the Hybrid Hexapod® technology in particular exists where precision means ultra-precision, and such accuracy is not always required. In a three dimensional space, an object can rotate about or translate along and on three axes. Thus, the object is said to have six degrees of freedom (3 rotational and 3 transitional) More “entry-level” motion control technologies for less exacting applications include precision linear actuators, linear translation stages, and rotation stages, all of which exhibit only one degree of freedom. Hexapods are characterised by 6 degrees of freedom (6DOF) which as we shall see make them appropriate for extremely exacting applications. Precision Linear Actuators. Many with even a passing interest in motion control will be aware of precision linear actuators — positioning devices that produce motion in one degree of freedom, and usually don’t include a guiding system for the payload. Typically electrically driven units are the most accurate, and some drive technologies such as electro-mechanical, piezoelectric, and linear motor acuators are capable of producing linear motion. Such precision linear actuators are designed to deliver high performance in situations that require continuous duty operation, and are often to be found in applications such as value control in vehicle applications and the process and packaging industry, pressing and clamping, edge-guide control, backstop adjust, loading and unloading, and drilling, welding, gluing or thermoforming. Linear Stages. A linear stage or “translation stage” builds on the principles of a linear actuator, but adds a workpiece or platform for fixing an application load, or for stacking extra stages to form a multi-axis configuration. The stage’s workpiece is a precision component with a linear bearing for guidance. Linear stages consist of a platform that moves relative to a base. The platform and base are joined by some form of guide that restricts motion of the platform to only one dimension. A variety of different styles of guides are used, each with benefits and drawbacks making each guide type more appropriate for some applications than for others. Roller guides, for example, are inexpensive, but are relatively low accuracy, have a relatively short life span and can be found in optics lab stages and drawer slides. Flexures, however, are a different kettle of fish, have excellent accuracy, there is no backlash, and they last pretty much forever, and are extensively used in optic fiber alignment applications. Rotation Stages. Rotary stages again only exhibit one degree of freedom, and comprise of a platform that rotates relative to a base. The base and platform are joined by bearings that restrict motion of the platform to rotation about a single axis. Precision motorized rotation stages are frequently used in bio-medical applications, or for semiconductor inspection, assessment of fiber-optical alignment, or X-ray crystallography. Air-bearing rotation stages — generally used for the highest precision and smoothness of motion/velocity — deliver ultra-low runout and wobble, as well as very high resolution and repeatability. For many manufacturers, any of the above mentioned one degree of freedom motion control technologies will afford the required level of precision. In addition there are adaptations of motion control technologies that offer 2 degrees of freedom, 3 degrees of freedom etc… that may also suit applications where micron and and sub-micron accuracy may not be critical. However, increasingly, industry is demanding greater and greater precision and nanometer accuracy, and when this is the case, such solutions are entirely inappropriate. Enter stage left hexapod motion control solutions. With hexapods, we are talking motion control technologies that operate with 6DOF, and have characteristics that make them appropriate for the most exacting of industrial applications where micron accuracy is an everyday requirement. First off, let’s nail what we mean by 6DOF. In it is most simplified definition, 6DOF refers to the specific number of axes that a rigid body is able to move in three dimensional space. It can move up and down, forward and backwards, and left and right (translation), and it can rotate in order to face a different axis (pitch, yaw, and roll). Hexapods are six-legged “parallel-kinematic mechanism” (PKM) motion systems. Most often, they consist of two platforms — a fixed base platform and a second movable platform — which are connected and supported by six independent legs that expand and contract in parallel (see Figure 1). By coordinating the motion of the six legs, the movable platform (and whatever is mounted on it) can move in any direction relative to the base platform. Here we have a compact technology that allows absolute freedom of movement in 3D space. 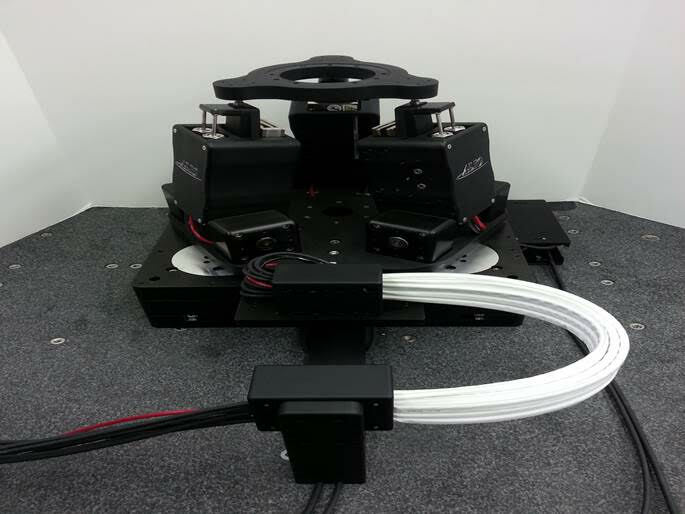 For manufacturers operating in areas where they demand micron tolerances the hexapod motion control solution has been revolutionary, and today it is used extensively throughout a range of sectors, most notable optics and medical. But in the world of precision engineering, the quest for better and better and more and more accurate technology solutions is inexorable, and whereas the standard hexapods that abound on the market today satisfactorily service applications where micron motion tolerances are required, as the demand for nanometer requirements expands, standard hexapods cannot keep up. This is where a new advance has just been made building on the hexapod platform, the Hybrid Hexapod® now unique among all motion control technologies in that it caters for ultra-precision sub-micron applications. As with any newly introduced disruptive technology, the starting point for ALIO Industries (creator of the Hybrid Hexapod®) was to listen to and respond to customer demand. ALIO — along with a number of highly skilled and reputable companies in this space — has a long pedigree in the supply of standard “micron” tolerance hexapods. But increasingly, industry began to articulate concerns about the limitations of hexapods for their more exacting applications. OK, so now here comes the technical bit, but we will keep it simple. There are performance limitations inherent in all “conventional” hexapod designs. All hexapod motion systems operate within three-dimensional space, and have errors in all six degrees of freedom. However, hexapod motion systems have typically only been characterized by performance data of a single degree of freedom. This practice leaves error sources unaccounted for in several degrees of freedom, especially in the areas of flatness and straightness, which are critical precision needs at the nanometer level. The hexapod’s best flatness and straightness of travel is still no more precise than in the order of magnitude of tens of microns per axis. Because hexapods have six independently controlled links joined together moving a common platform, the motion error of the platform will be a function of the errors of ALL links and joints. Hexapods are known to have optimum accuracy and repeatability when performing Z-axis moves, because all links perform the same motion at the same relative link angle. However, when any other X, Y, pitch, yaw or roll motion is commanded, accuracy and geometric path performance of the hexapod degrades substantially because all links are performing different motions. In the case of legacy hexapods built with non-precision joints and motion controllers that are not capable of forward and inverse kinematics equations, the source of error is even more pronounced. Furthermore, it is generally accepted that hexapods have relatively good stiffness compared to serial stacked multi-axis systems. However, it is often only the hexapod’s “Z” (vertical) stiffness that is considered. Geometric design stiffness has a critical impact on and hexapod’s platform repeatability and rigidity. A lack of design stiffness relates directly to a weak XY plane stiffness with the conventional hexapod working platform. Moreover, this inherent design flaw of the conventional hexapod negatively affects XY axis performance, especially with thermal bonding or machining applications that require more force to be performed accurately within the XY plane. While there are compensation methods to reduce error sources in conventional 6-link hexapods, they do not improve performance at the single-digit micron or nanometer level. Motion systems’ straightness and repeatability performance must be analyzed and specified using a “point precision” methodology that accounts for ALL 6-D spatial errors in order to provide a true representation of nanometer precision, or what we can call “True Nano” precision. 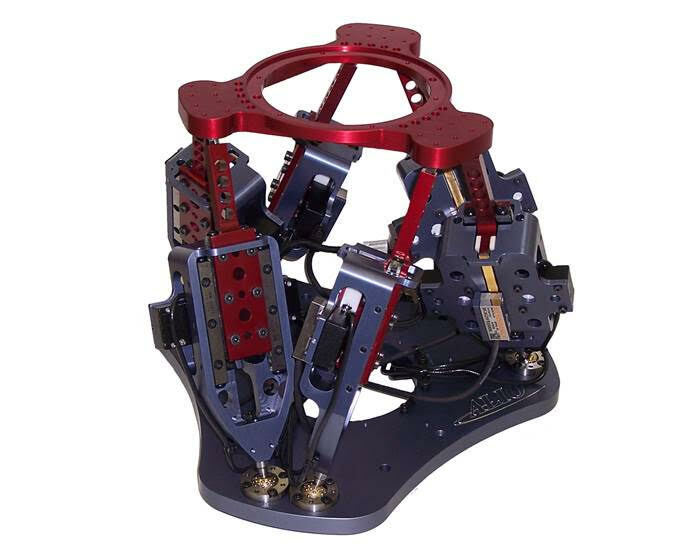 The Hybrid Hexapod® was developed to address the critical weaknesses of conventional legacy hexapod designs as outlined above, as well as the weaknesses of stacked serial stages, and to achieve nanometer accuracy, repeatability, and high-integrity flatness and straightness during motion. The name Hybrid Hexapod® is indicative of a 6DOF function motion positioning system constructed of a hybrid serial and parallel kinematic structure, rather than a six-link pure parallel kinematic design structure seen in traditional hexapods (see Figure 2). It utilizes a tripod parallel kinematics structure to deliver Z plane and tip/tilt motion, integrated with a monolithic serial kinematic structure for XY motion. A rotary stage integrated into the top of the tripod (or underneath it depending on application needs) provides 360-degree continuous yaw rotation. In this hybrid design, individual axes can be customized to provide travel ranges from millimeters to over one meter, while maintaining nanometer levels of precision. We started this article by saying that all information provided had to pass the “so-what” test, while at the same time elevating the value of ultra-precision motion control systems from a necessary evil to a truly disruptive enabling technology. As an engineer working at the cutting edge of what is possible, you must be stimulated to ask more as you see that this technology reaches places others cannot, has the potential to promote innovations, and will optimise your efficiency and cost-effectiveness in manufacture. At this stage, motion control articles typically disappear into pages of equations and descriptions of mathematical models that “prove” the working of the technology and how it measures up to alternatives. Let’s make one thing clear from the get go. Conventional hexapods are a great technology, but as is the case in all industry sectors, things move on, and pioneers in ultra-precision engineering are continually adding to the palette of technology options available to engineers. If you are happy with micron accuracy a traditional hexapod may serve you well. But the Hybrid Hexapod® provides orders of magnitude improvements in precision, path performance, speed, stiffness, and larger work envelope with virtually unlimited XY travel, and fully programmable tool center point locations at the same price point as normal hexapods. So saying, while it achieves less than 100 nm 3-dimensional 6 axis point precision repeatability, (making it an essential technology for sub-micron mission critical applications in the laser processing, optical inspection, photonics, semiconductor, metrology, and medical device sectors — and indeed all micro-machining projects) it also arguably provides an obvious alternative to a conventional hexapod for micron tolerance applications. Returning to our motoring analogy earlier in this article, you may not always need a Rolls Royce to go to the shops, but if you can go in a Rolls Royce to pick up the burger buns for the same price as a going on a push bike, why wouldn’t you? As an engineer, the Hybrid Hexapod® is now forcing you as a professional working in the ultra-precision engineering space to look outside the box, raise your eyes to new horizons, recognise that there is now a new generation of ultra-precision motion control technology that allows you to achieve engineering goals you considered were previously impossible. The precision and ultra-precision engineering world has a history of such quantum changes, technologies in the area of plastic molding now allowing the manufacture of dust-speck sized components, metrology options allowing the measurement of previously impossible geometries and details, and new machining technologies achieving the manufacture of seemingly impossibly precise and complex parts and components. The Hybrid Hexapod® adds advances in motion control to that list. Engineers and manufacturers now need to look at their applications and achievement of tolerance parameters through the following prism, and innovate and create without restriction. You can now use a motion control technology that due to the use of high-dynamic non-contact linear motors can achieve velocities from microns per second to hundreds of millimetres per second; 1-2 orders of magnitude better bi-directional repeatability when compared with conventional hexapods; nanometer level step sizes; no backlash; no hysteresis; smoother, straighter, flatter motion; and a mean time between failures of over 80,000 hours! In the world of 6DOF nanotechnology applications, the Hybrid Hexapod® technology allows for the provision of documented proof of performance over all six degrees of freedom of a body in motion at the nanometer level of precision. As such it is unique, and this is the first time that this has been possible. We now see leading blue-chip OEMs working on nanometer applications in the optical, semiconductor, manufacturing, metrology, laser processing and micro-machining sectors, and achieving successes previously unattainable. Nathan Brown is Vice President of Engineering for ALIO Industries. Nathan has extensive experience with the design, development, manufacturing and testing of next-generation precision motion systems. He holds a degree in Mechanical Engineering from the University of Texas at Austin.